Extractions are typically one-time lists. This article will explain the basics of creating your Extraction in Tessitura for import into WordFly. For more information or technical advice about List Manager lists, please reach out to Tessitura support for expert guidance. 1. In Tessitura, select GoTo > Extraction Manager from the top navigation. 2. Scroll to the bottom of the page and select New. Before filling in any of the sections, click on the small black arrow on the right side of the Extraction details. This will open more options that are required for your list to show in WordFly. Description: This becomes the name of the Extraction. Omit special characters (~`! @#$%^&*+=) when naming your Extractions. Appeal No: This has to be written in for WordFly to see the Extraction. TMS box: This has to be checked for WordFly to see the Extraction. Control Group: This has to be the same control group used by the TMS_User for your WordFly TR_Organization ID. Many times this is the default control group. Consortium sub-licenses will need to know the correct control group to select. 4. To add a Segment, scroll down to the bottom of Extraction Details and select New from the lower left corner. This adds a new Segment to the Extraction. Give the segment a name in the Description field. 5. Double click anywhere on the Segment to open the List Criteria window to setup your criteria. Add all the specific criteria for this segment. This is a drag and drop window. Pull your criteria over from the left side into the criteria pane. When you are done, select “Close”. Follow steps 4 and 5 again to add more Segments to your Extraction. You can also add suppression segments to exclude subscribers from the list. 6. Click Close when you're done adding your list criteria. 7. Scroll to the bottom of the Extraction Details and select Save in the lower right corner. 8. When it is done saving, scroll to the bottom again and select Close in the lower right corner. 9. 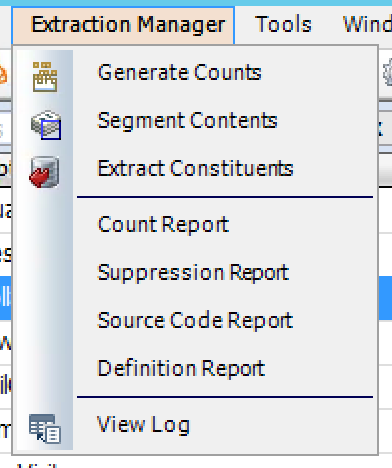 Highlight your new Extraction, then select Extraction Manager > Generate Counts from the top navigation. 10. From the Generate Counts window, select OK.
Usually you won’t have to make any changes, just select “OK”. And then select “Yes” from the next window. This will trigger your Extraction to start counting the recipients that meet the list criteria. 11. When the Extraction is done counting, it will be in an “Open” status. Highlight the Extraction again and select Extraction Manager > Extract Constituents from the top navigation. Select the ‘File’ radial button from the Extract Constituents window. This allows the actual file to be collected by WordFly for import. [v12 Tessitura interface] Select a source option from the ‘Generate Source Codes’ dropdown and then check the box ‘Create Promotions Now’. 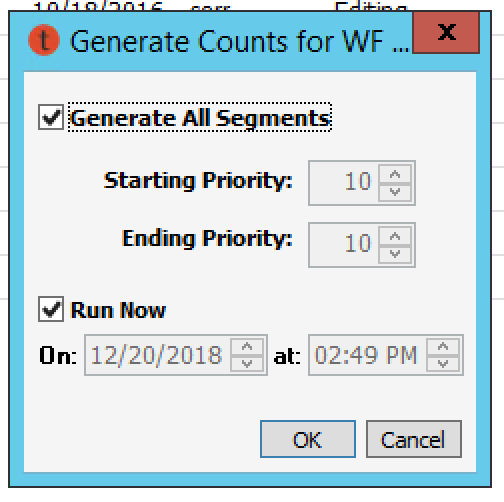 Select an Output Set OR keep this selected as (none). 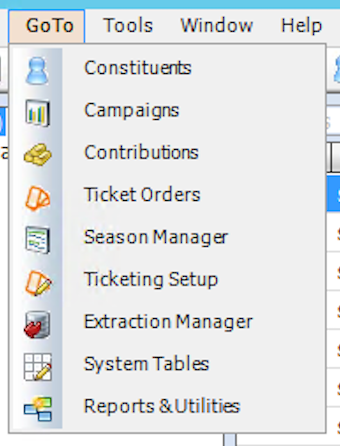 The '(none)' option will use the default Tessitura Extraction output set which includes a standard list of data. 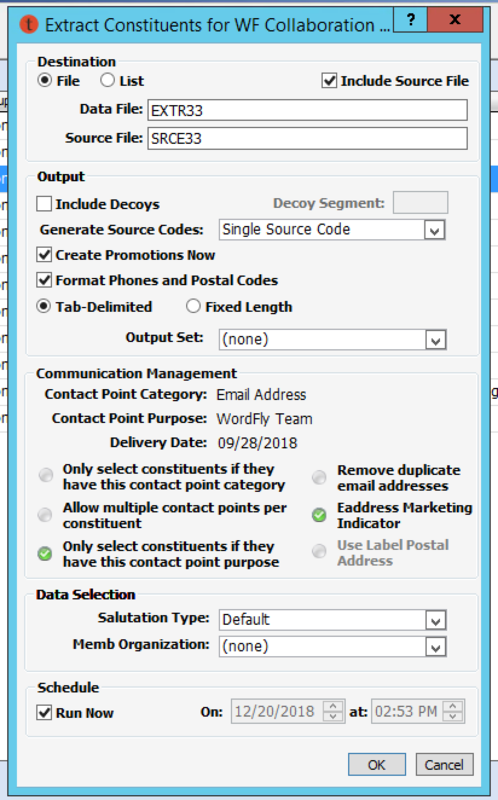 If you want additional data for more email personalization, create a new output set or select a specific output set. Check out this support post if you run into any issues with your Extraction. Or, email us for one-on-one guidance!